Syber, a division of CyberPowerPC, introduced a slew of new Steam Machines today at GDC 2015. CyberPowerPC was one of Valve's early Steam Machine partners, announced way back in January 2014. At the time the company only had one Steam Machine (granted, with multiple customizable loadouts) to show off, but this year they plan to release a full half dozen. These six include the Steam Machine-Mini, Steam Machine-Mercury and Steam Machine-Switch, as well as the Steam Machine-P, Steam Machine-K and Steam Machine-X. 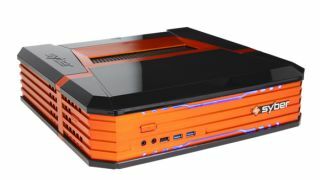 The $450 (about £290, AU$575) Syber Steam Machine-E is the starting point, with a quad-core AMD processor and NVIDIA® GeForce GTX graphics, while the high end is occupied by the $1,400 (about £910, AU$1,780) Steam Machine-X. All six models are also customizable with a variety of colors, including a new orange shade, and Intel, AMD, Radeon and Nvidia components. Syber's Steam Machines will launch alongside those from other manufacturers this fall.